Toyota Safety Sense is being rolled out across the range following its introduction earlier this year in the new Avensis and Auris. Aygo and Yaris customers can now specify the package as an option on their new car, adding to the models’ already impressive active and passive safety features. On Aygo, Toyota Safety Sense provides a laser-controlled Pre-Collision System that warns the driver of an imminent collision with a vehicle ahead (Forward Collision Warning) and readies Pre-Crash Brake Assist to deliver emergency braking as soon as the brake pedal is pressed. Should the driver fail to take action after the warning, the system will initiate Autonomous Emergency Braking to reduce speed by about 19mph, potentially bringing the car to a stop, to prevent a collision or reduce the force of impact. The Forward Collision Warning works at speeds between 10 and 86mph, when the relative speed between the Toyota and the car ahead is greater than 10mph. The Pre-Crash Brake Assist functions at speeds between 19 and 49mph, with relative vehicle speeds greater than 19mph. For Autonomous Emergency Braking, the speed range is from seven to 49mph. A Lane Departure Alert function is also included. This monitors lane markings on the road and helps prevent accidents and head-on collisions caused by a vehicle moving out of its lane. If the car starts to deviate from its lane without the turn indicators being used, the system alerts the driver with visual and audible warnings. The same Toyota Safety Sense features are available for Yaris, together with Automatic High Beam. This detects both the headlights of oncoming vehicles, and the tail lights of vehicles ahead, automatically switching between high and low beams to avoid dazzling other drivers and improving the driver’s night-time vision. 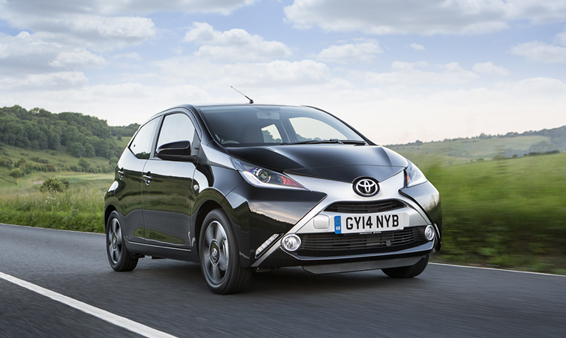 Toyota Safety Sense is available now as an option on all Aygo models apart from x grade, price £375. The package for Yaris (all grades apart from Active) costs £400. I bought my Auris TS Hybrid a week ago. Is it possible to add the SafetySense features after purchase? Thanks for your post. Unfortunately, SafetySense is not available as an accessory. Many thanks! Hi just bought 66 plate yaris. On ignition says on dash ‘tss off’. I thought it was defaulted to stay on. We’d have to recommend speaking with your local dealer as this could be a fault with your system. Is the new Hilux going to have all of these features? Thank you for your post. Toyota Safety sense is optional on grades Active and Icon and is standard on grades Invincible and Invincible X. Hope this helps and if you have any more questions please let us know. Can these features be added to existing models. I purchased my Aygo X-clusive in December 2014. Hi Gethin, unfortunately you can’t retrofit these features to an existing model from last year. Morning Gethin, apologies for this – the nature of our products is that they are regularly improved. With safety sense features it is more than a simple bit of software and would be complicated to retrofit to even a car a week before the new technology was introduced. Hope this explains it somewhat. Hello Gethin, please see your twitter feed where we have responded to you as well – thank you.